Produced in October 2018, this is the 7th version of iPad Apps for Learners with Dyslexia / Reading and Writing Difficulties to be produced since it was first launched in October 2013. This has been the most popular poster that we have produced in recent years and has now been downloaded over 130,000 times from the CALL web site. 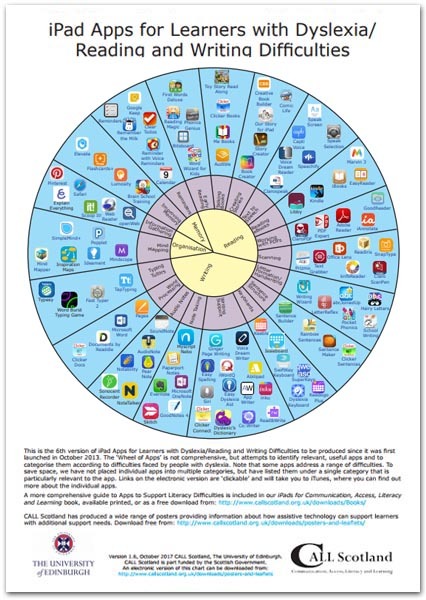 The 'Wheel of Apps' is not comprehensive, but attempts to identify relevant, useful apps and to categorise them according to difficulties faced by people with dyslexia. Note that some apps address a range of difficulties. To save space, we have not placed individual apps into multiple categories, but have listed them under a single category that is particularly relevant to the app. Links on the electronic version are 'clickable' and will take you to the iTunes UK site, where you can find out more about the individual apps. For this Version, 10 apps have been added: Clicker Connect, DD's Dyslexic's Dictionary, Explain Everything Whiteboard, Issieboard, Libby, NoteTalker, Skitch, Sonocent Recorder, Typesy, Word Burst Typing Game. Eight apps have been removed as they are no longer available, or they have been superceded by more recent apps. : The Three Pandas, Speak It! Blio, CapturaTalk, Writepad, Typing Tutor, Outline Pro, My Secret Diary. Links and icons for a number of other apps have been updated.